Homeopathic remedies are no better than a placebo at improving the quality of life of asthmatic children, a new study has said. The study - the first to test the effect of classic homeopathy in asthma - was published in the journal Thorax and led by Dr Adrian White, of the Peninsula Medical School in Exeter. It claims homeopathy is no better than dummy remedies at improving the quality of life in a child with mild to moderate asthma who is also given conventional treatment. The Society of Homeopaths says alternative therapies fulfil an important role in healthcare. In the UK, homeopathic treatments are widely used by children with asthma - and one survey found about 15% of youngsters with the condition had tried them. The study involved 93 children from five general practices across Somerset who were aged between five and 15. 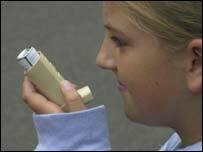 The children had mild to moderate asthma which was treated in the usual way with reliever or preventer inhalers. In addition, half the children were given homeopathic remedies in up to six sessions over the course of a year. The other half were given placebo remedies instead of homeopathy. Questionnaires to assess quality of life were completed at the start of the trial and 12 months later. The study found no evidence that homeopathy had any measurable impact on quality of life. Although the severity of symptoms lessened among children taking the homeopathic remedies, it did not lesson to a greater extent than among those taking the placebo. The study said the research was "pragmatic" as it let homeopaths practise in their normal way by combining prescriptions with lifestyle suggestions and advice. The Society of Homeopaths said: "Homeopathy is a unique medical system and therapeutic discipline which fulfils an important role in healthcare. "It serves to prevent ill-health as well as being of benefit to most patients in both acute and chronic disease."